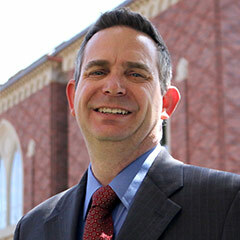 Jeffrey de Caen, MBA, is the associate dean for operations at the USC Thornton School of Music. Since his start at USC in 2001, de Caen has spearheaded the development of organizational, financial, and work flow architectures, overseen numerous facility improvements and changes, created and developed operational, production, technology, and piano maintenance environments, spurred dozens of Visions & Voices projects, and acted as lead on numerous special projects. He was the chief school liaison for the construction of the new Glorya Kaufman International Dance Center as well as the creator of the operational support model for this brand new school. Working closely with Artistic Director Ralph Kirshbaum, de Caen was the inaugural executive administrator for the 2012 Piatigorsky International Cello Festival and reprises that role for the second iteration of the event in 2016. Facilities improvement projects include the Simon Ramo Recital Hall, Jeanette MacDonald Recital Hall, and Alice and Eleonore Schoenfeld Symphonic Hall as well as the facility transitions and improvements of The Music Center and Gateway Practice Facility. This Southern California native holds degrees in music, recording engineering, and business administration. His studies have also included the study of German and International Relations at the University of Bonn, Germany and the study of Gregorian Chant at the Benedictine Abbey in Solesmes, France. De Caen leverages a mix of almost 20 years of higher music education administration experience and many years of work in the industry including posts at A&M Recording Studios and Universal Music Publishing. 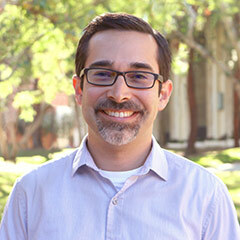 Evan Calbi is the director of communications for the USC Thornton School of Music. He has overseen the launch of a new and comprehensive communications strategy including a focus on digital media, feature content, and media relations. For over two years, he took on additional responsibility as director of communications for the USC Glorya Kaufman School of Dance, the first new arts school at the University of Southern California in over 40 years, overseeing the communications strategy for the school’s launch in Fall 2015. Before joining USC in 2007, Calbi oversaw communications for the Da Camera Society of Mount St. Mary’s College and worked at PolyGram Music Publishing. A native of Los Angeles, he often works as a freelance writer and editor. He earned an MFA in writing from USC in 2010, and recent work has appeared in the Los Angeles Review of Books. Previous publications include a commemorative book, Eudice Shapiro: A Life in Music, 50 Years of Teaching at USC, and L.A. Exile; A Guide to Los Angeles Writing, 1932-1998, an anthology of writing which was reviewed favorably in the Los Angeles Times and San Francisco Chronicle. A bassist, he is an active freelance musician in Los Angeles. Dr. A. Phoenix Delgado is the associate dean for advancement at the USC Thornton School of Music. He received his Bachelor of Music and Master of Music degrees from the USC Thornton School of Music in flute/vocal performance and orchestral conducting, respectively. Most recently, he completed his Doctor of Musical Arts degree at USC Thornton in flute performance, with elective fields in conducting, theory & analysis, and transformative executive leadership. In the fall of 2012, Delgado was named the new music director and conductor of the New Valley Symphony Orchestra and most recently, he served as the music director and conductor for Broadway, film and television star, Kristin Chenoweth. In addition, Delgado’s guest conducting resume includes the Chamber Ensemble of Rome, Young Musicians Foundation Debut Orchestra, Bay Area Rainbow Symphony and Golden State Pops Orchestra. As a flautist, Delgado was a soloist with the Los Angeles Philharmonic at the age of 21 and continues to be a performer of choice for high-profile events and records for film, television and video games. His former principal positions include the El Paso Opera for nine seasons, the Cypress Pops Orchestra and the Golden State Pops Orchestra (GSPO). Prior to coming to USC Thornton, he served as executive director for The Harmony Project, a non-profit organization that continues to offer music education to underserved children, and was instrumental in the organization’s development. He is the founder of Harmony Project’s Summer Festival Orchestras, the Harmony Project Orchestra, and the Hollywood Youth Orchestra. Furthermore, he formed the LA Philharmonic’s EXPO Center Youth Orchestra which has been conducted by Gustavo Dudamel at the Hollywood Bowl as part of Youth Orchestra LA (YOLA). Susan Miltner Lopez, Associate Dean for Finance and Administration, is the chief financial officer for the Thornton School of Music. For more than two decades, she has provided leadership in budgeting, strategic planning, academic resource and program planning, enrollment management, large-scale facilities planning, and human resource and business office operations. She has also held a parallel role at the Glorya Kaufman School of Dance since its founding in 2012. 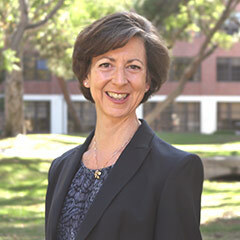 Prior to her tenure at USC, Lopez served as Director of Student Services and Admission at the Aspen Music Festival, and was on the staff of the Marlboro Music Festival. She earned her B.M. in Piano Performance and B.A. in History from Oberlin College and Conservatory. She holds an M.B.A. from the USC Marshall School of Business. 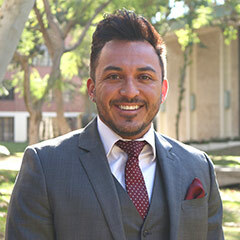 Lopez has served as presenter and accreditation evaluator for the National Associate of Schools of Music, and is an active member of the Western Association of College and University Business Officers. Phillip M. Placenti, Ed.D, is the assistant dean for admission and student affairs at the USC Thornton School of Music. Originally from Central California, Placenti holds a bachelor’s degree in music (piano and voice), a master’s degree in public administration, and a doctorate in education, all from USC. He began his work in higher education as a recruiter for the USC Thornton School of Music, later becoming the director of admission and financial aid, and has been assistant dean for admission and student affairs since 2007. In this role, Placenti gives leadership to the areas of recruitment, admission, academic advisement, student support, and scholarships. Placenti is also active in faith-based community efforts in the USC neighborhood, including literacy and tutoring programs for elementary school children. He enjoys reading, road-tripping, and soaking up the multicultural character of Southern California. Above all, Placenti cherishes quiet time with his wife and two daughters, especially on trips to the Central California coast.